We all have workplace dress codes—they’re part of our branding, whether spelled out or unspoken. TIP for timelines, About Us pages, and business anniversary campaigns: At CorporateHistory.net we’ve had fun showcasing uniforms and logowear for our clients, like the shirts (above) featured in Soap in the Veins: 50 Years at Dempsey Uniform & Linen Supply. And now New York’s Fashion Institute of Technology (FIT) Museum has unveiled a whole exhibit called “Uniformity,” running until November 19, 2016. 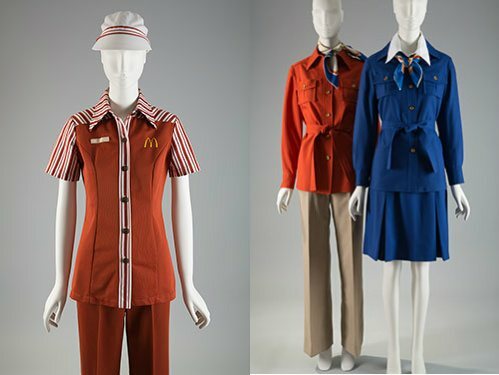 While it’s heavy on military garb and school styles, I reveled in Stan Herman’s McDonald’s USA 1976 uniform and his 1975 TWA flight attendant uniforms, made of glorious synthetics that are itchy even to look at.